The survey shows the average salary level of Indian Technical Communicators in 2013 has increased by 16.8% compared to the same in 2012. 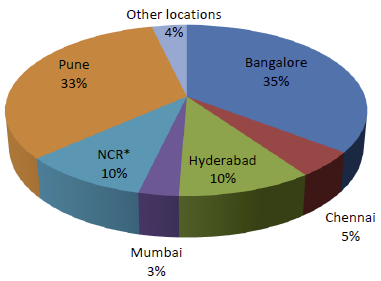 For the same experience level, Pune is the highest paying city in India closely followed by Bangalore. Base: The total responses in a given category. Mean: The value computed by averaging the tabulated responses. 10%: Ten percent of the responses were below this value; ninety percent were above this value. 25%: Twenty-five percent of the responses were below this value; seventy-five percent were above this value. 50%: Fifty percent of the responses were below this value; fifty percent were above this value. This is also called the median. 75%: Seventy-five percent of the responses were below this value; twenty-five percent were above this value. 90%: Ninety percent of the responses were below this value; ten percent were above this value. TrimMean: This value is the mean taken by excluding 10% of data points from the top and bottom tails of a data set. In other words, this is an average of values excluding the extreme cases. NCR- National Capital Region (NCR) in India is the designation for the conurbation or metropolitan area which encompasses the entire National Capital Territory of Delhi, which includes New Delhi, as well as urban areas surrounding it in neighboring states of Haryana, Uttar Pradesh and Rajasthan. Are you working as a technical writer in India? Are these average salaries near to the real figure? Leave a comment and let me know. Thanks a lot for this post! It’s giving me a fairly good idea of where I stand, and how much I can expect to earn next year! 😉 I have completed about 2 years working as a freelancer, in Pune. But, so far I have just worked for this 1 company as it is run by a close friend. Initially i started off working for them from home, but it became too tedious, and now they have assigned me a workstation in their office itself, and the workflow has become much smoother and the work comes at my office desk rather than me having to approach people for it. Also, the uncertainty from their end regarding what I am currently working on has also reduced and I have become more approachable by the people in my friend’s organization. I earn between 3 and 4 lakh rupees a year. Very good stats. These figures should help recruiting agencies and companies understand the underlying salaries of tech writers.